Thanks Tony. That all helps. Also, does the project's timeline frame rate matter? I tested all 16 test clips I produced in PD17, and all of them read as progressive. OP's 16.26.37.mts clip always reads as interlaced (like clip 00001.MTS in your screenshot) and Produce.MP4 always reads as progressive (like your 00000.MTS clip does), regardless of my project's timeline settings - but PD17 also doesn't have the "quaky mess" producing issue. I'm curious to see if PD16's timeline frame rate setting has any impact on how PD interprets the TV format when importing interlaced clips. That would be another big clue! Therefore I use not PowerDirector when I have interlaced footage. Roland vl – PD16 had problems with interlaced video as reported and seen by other users. The Cyberlink support solution apparently helped at least a few users in these posts: https://forum.cyberlink.com/forum/posts/list/76319.page#312309 and https://forum.cyberlink.com/forum/posts/list/64952.page . I'm getting closer to understanding what's going on at my end (at least)... & I think Roland vI's point is correct about PDR16. Recording using either of the first two options will create the mess with a LUT applied & producing to 50fps progressive - in PDR16 but not 17. Recording with the other 3 creates no issues. I don't even know what the difference is between "separated" & "interleaved" fields. Anyway - here's a packed project containing one clip using each recording option & the LUT I used in testing. Here's a 50p produced file from PDR16 - don't view if you're badly affected by flashing lights etc. PDR17 isn't afflicted with this issue, thankfully. Quote I don't even know what the difference is between "separated" & "interleaved" fields. I am not using the latest mediainfo so the Scan type, store method : Separated fields line is not shown in my report. Here is a post and a discussion in the MediaInfo forum: https://sourceforge.net/p/mediainfo/discussion/297610/thread/f2459e8b/ . This reminds me of the Canon HDV camcorder that I once consider buying. 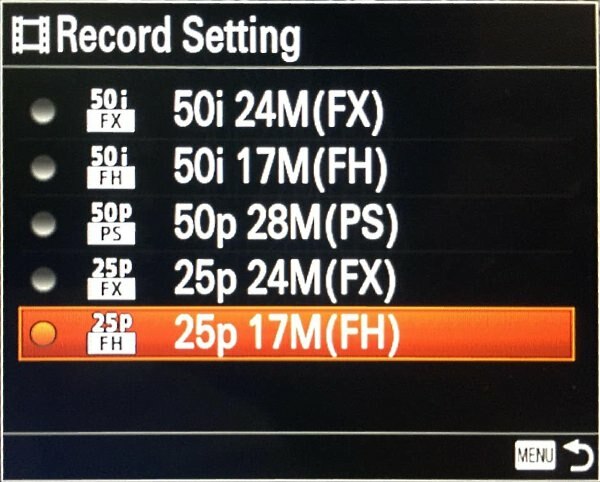 The 24p setting actually store the video in a 60i container which is the American TV broadcast standard at the time. See this post: http://www.dvxuser.com/V6/showthread.php?86065-Canon-HV20/page4 . It does not surprise me that 24p video can be stored in interlaced fields. Scroll down to the Elton 02-01-2007 07:10 PM post to see it. I don’t know if the Sony avchd camcorder is doing something similar like progressive scan video frame separated and and stored as two interlaced field. That way you don’t see any jagged mice teeth when the vlc player deinterlace is turned off instead of being set to auto or on. You press the E key to go to the next fame with each keypress. It is possible someone in the forum know more about it. On Alan's immediate issue with PDR16, interlaced MTS files, LUTs & 50fps production, my simplistic workaround would be to pre-render the offending clips as 1080/50p before applying any LUT. Wow I didn't need 6 days grandad duty to realise a lot of whats been said was a little over my head and it is refreshing Tony to read your thoughts #MeToo comes to mind. As OP I am happy that this exchange has at least lead me confidently down the path to reprocess mts to mp4 before I start the project, and so far this minor inconvenience has worked except that I issue a warning about my (innocent) choice of converter. I installed Prism Video Converter software from NCH Software which did the job just perfect but left a nasty taste - it took over a whole load of file associations which it assigned to itself without asking - which really annoyed me. Needless to say its use to me has passed and I have uninstalled it and made a note to never touch anything from NCH again. Just to be sure I installed it a second time and it definitely does not ask permission. And then the final twist - I discovered VLC does just a good a job, and have it already installed and trusted on m PC - hey ho !!! Pleased to be able to report we got a result from CL. They acknowledge the problem and have provided a hot-fix solution ( as they say ) . Basically they sent me LUT.ax file to replace the original one deep in CL/PD16 installed file hierarchy, and it works a treat exactly as expected. So 2 solutions - convert to mp4 those mts files that need CLUT treatment - or instal this hot fix.